When medical therapy is no longer able control glaucoma our Veterinary Ophthalmologists will discuss surgical options to help maintain vision and normal eye pressure. There are two broad categories of glaucoma surgery: the placement of an artificial valve to allow the fluid inside the eye to drain and surgery to reduce the amount of fluid being produced inside the eye. 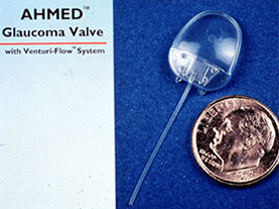 In Veterinary Ophthalmology the most common artificial valve is the Ahmed valve. The main portion of the valve is placed under the conjunctiva (the pink tissue around the eye) while a tube is inserted inside the front fluid chamber of the eye. When the eye pressure rises to 10-12mmHg the valve opens and the fluid is able to drain into the conjunctiva. Endolaser cyclophotocoagulation (ECP) is a surgical procedure where a small endoscopic probe is inserted inside the eye. 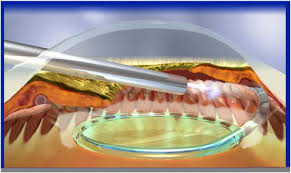 The probe allows the surgeon to see the ciliary body (the tissue that produces the fluid inside the eye) and then laser it. By damaging some of this tissue we reduce the amount of fluid being produced, helping to control glaucoma.